Solar Powered Mailbox Light Address Sign - - custom solar address sign curbside mailbox system complete with post, cross arm, and brace that hold both the solar sign and the mailbox. Solar powered address panels on three sides light up at night. 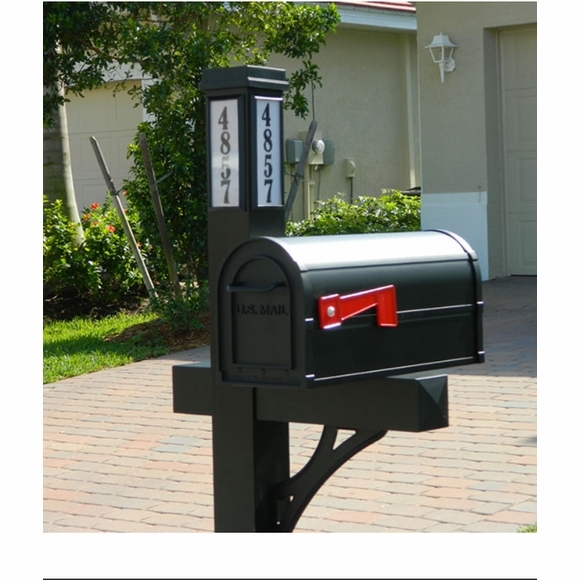 Three piece mailbox system comprises a curbside mailbox, solar powered house number sign that also illuminates the mailbox, and wooden post. Designed to assist police, fire, and medics find your house at night in case of an emergency. Numbers can be seen from vehicles approaching from either direction and from across the road. Each of the three panels holds either five (5) 1" numbers or four (4) 1.25" numbers. Package also includes multiple packs of self-stick vinyl number sets (0-9) for you to apply to the panels. You should have numbers left over for other projects. No electricity or wiring required. Ultra-bright LED light sources. No bulbs to change ever! Solid extruded and cast aluminum parts. Durable powder-coat paint finish stands up to harsh environments. Long-life 1500 mAH NIMH battery provides maximum brightness all night. Up to 20-plus hours of illumination on a full charge. Quick and easy battery replacement. No tools required. Mailbox comes in four colors: smooth black, textured bronze, lightly textured white, and textured pewter. Overall dimensions of assembled unit: 22.5"W x 20"D x 42" to 46"H plus approximately 24" for in-ground burial. Assembly required. All hardware included. Mailbox colors: black, bronze, white, pewter. Comfort House P2101. Special order. Unique solar mailbox system consists of a curbside mailbox, solar powered house number sign, and post. Bold, solar-powered address panels on three sides light up at night.